Ever since the release of iPad Mini, the critics have never left it alone. It was either blamed for the high rate with limited features or constantly got compared with the competitive tablets, making iPad Mini a waste of your money. This has been a big blow for Apple, as even iPhone 5 did not bring miracles for the company. While most of the tech audience believed that Steve Jobs took the magic of Apple to the grave, iPad Mini finally showed development after the 2012 Christmas holidays. Recently, KinderTown – one of the best educational applications finder for kids of preschool and kindergarten released a shocker; iPad Mini went from a drastic to a yet extremely impressive increase in sales after the Christmas holidays. Later, it was illustrated that the app installment in iPad mini was mainly of those apps that are ideally made for kids in preschool and kindergarten. Much after the hit, KinderTown suggested to a lot of parents that they should invest in this particular slate for their young and emerging kids. Created with the motive to fulfill the mission of children in their studies, KinderTown pulled a data from across 200,000 users to draw insights about the device, keeping in mind the usage of it for preschool children. They used their app known as KinderTown app – an app that stands as a substitute for Apple’s App Store, but it only features those apps that are kid-friendly in nature. Price, category, preferred age and educational value of a particular app are mentioned under each app. Since parents use KinderTown App to buy and find apps for their kids, these are usually found in the entire range of devices that are used by children. The company shared that the users of KinderTown apps on every device changes week-to-week in normal rate; but after the Christmas holidays ended, the week wasn’t normal for the company. When the year’s biggest and happiest gift-giving day ended, iPad mini went through a sweeping increase in sales. Of course, this was a big shocker as only we expect such increase from a new device. Approximately, the increase was more than 270% than the previous sales and usage. Looking closely to what the company said, it was apparent that aside from iPad mini, even iPod Touch – 4thor 5th generations and the new iPad – 4th generations also saw big boots of success. However, from all the 3 big hits, KinderTown parents were and still are preferring iPad mini over the old and new iPad. The company also noted that the older versions of iPads are in considerations as the parents pass down their old devices to their kids when they get a newer one. This indicated the increase in usage of iPad 1 after the Christmas holidays. From the data provided, KinderTown users in total preferred and used iPad mini over the latest iPad. This is proven by the post-Christmas breakdown; when iPad mini’s usage amplified by 270%, on the other hand, iPad 4th Generation’s got on 190% increase. The conclusion by the company KinderTown was that iPad Mini is now being purchased at a rate that is faster than before. Does this mean that Apple is back on the track? 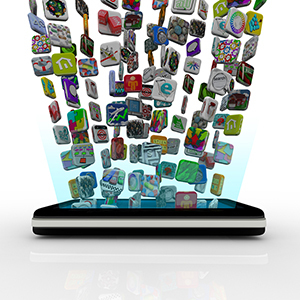 Mobile Apps are gaining fast recognition for the ease of use, simplicity of design and value of utilization. The Apps function in mobiles has now become a separately recognized entity in itself, rather than a humble extrapolation of online technological capabilities. The investors and stock holders is anticipated to be attracted to this particular industry because of the potentially unlimited applications that can be run using the computer and the telecommunication capacities of the modern cell phone. The Smartphone as we call it now, is going to have a unique platform through which technological innovation and user satisfaction will thrive. The first trend in the mobile Apps will be the facility of location dependant service. Location based Apps and services is likely to become very popular, because the user will be provided with an option to access the digital services, facilities and functionalities; and it will be based on the real time location, situation and personal verifications of user (gender, age and personal preference). This would definitely make for a more intelligent and efficient experience. Social networking is the next best trend on the mobile Apps. Facebook and Twitter, the popular social networks have already made their website compatible for Smartphone and mobile viewing. The social networking software and App that will provide add-ons services like email, messaging, audio/video chat and games will be a huge boon for the social networking as well as the mobile industry. The mobile Visual analysis is a relatively new field of App that is being introduced on the mobile. The ability to compare online dinner offers, hotel reservation costs, insurance policy costs and so many other services, will hold tremendous advantages for users helping them to make streamlined decisions and cut down on costs. This App will be attracting a lot of non-technology savvy people who are more inclined to practicality than the aesthetics of its function. Conducting commerce on the mobile will also become a possibility. The fact that a user can be virtually present in a store in form of a digital signature, to check in or prove his attendance is simply an ideal facility. So is the ability to add items of shopping to a pay cart by simply uploading their pictures as a form of barcode; both will be made possible through the Apps for mobile commerce. These were the major Apps, but what about the other Apps that is sure to be virally spread in popularity? The concept of close range communication payment would become basically the highest in demand use of a mobile, offering functioning as an ATM or a credit card. Although the possibility of mainstreaming this App will appear in a while, their security implications still need to be worked out. Object recognition is another latest Apps trend that will be implemented. This App will allow the user to recognize and replicate the user specifications based on the recognition of a location, place or objects in the environment. Apps that make use of mobile Instant Messaging are anticipated to join the main stream by 2015. Mobile email is yet another one of these attractive trends that will be universally applicable to all mobile phone in the next year or so. So, the mobile App trend can be said as a fast rising wave that will engulf all who take to its seamless application into general society. Enterprise Resource Planning systems are crucial for developing innovative technologies for successful business. Hence, most of the business developers are investing on innovative ERP related technologies. OpenERP solves this issue and manages all external and internal information efficiently. OpenERP can be used in any business environment to achieve better management. OpenERP is an open source integrated enterprise planning software, which has committed to Open Source Business Model. It is a comprehensive suite of business applications including Project Management, Accounting, Human Resources, Manufacturing, Warehouse Management, Marketing and Financial Management. OpenERP ensures a robust sale, which plays a central role in business development. It is an integrated business intelligence software and a key to your business success which is based on dynamic dashboards, vast applications and smart frameworks. It consolidates data in real time, which automatically designs a custom report and statistically ties up the task of a sales team management in one document. From last 8 years; Open ERP has grown tremendously in the market. It has become a leader within a small to medium size business community because of its innovative tasks. It is the software, which covers all your enterprise needs and automates tasks by integrating business processes. If you start your project from one integrated module, you can expand it as business grows, flexible to customize workflows in one application and create a chart. Open ERP is a new generation in business world for ERP solution. Free download: It is a web based software which easily downloads and can test the product in few clicks. The developers update the software regularly and introduce new applications day by day. Design the Application in less time: It designs full featured applications in much less time from the existing business modules and creates other parts on smart framework. We can design various files by High-level application developer including module of Screen designing, report designing, workflow designing and Module packaging. Control Management: Efficiently controls the managerial processes including financial management, project management, team management, document management and sales management. In sales management, it controls all data of sales orders, deliveries, invoicing and manage information of salesman. It also has Trace ability of all customer operations. Activate new modules on demand: Through Open ERP, you can easily extend your applications by updating modules on demand. For this purpose, it has integrated feature, which is called module recorder. Automate tasks: It automatically generates different tasks including invoices, price lists etc. based on different logistics. It perfectly integrates software with accounting, stock manufacturing and project management. Classify sales orders into a hierarchical structural: It manages and classifies sales orders, price lists and other data into a structural system, which is easy to understand and manage. Automatic accounting (financial and analytic): It automatically generates time sheets, track of costs and payroll based on task achieving. Financial management module is integrated with human resources for cost control. OpenERP is flexible to customize, easy to install and has the ability to grow business with integrated tools. Open ERP enables an organization to control and optimize all its activities. The use of HTML5 for web designing is justified by the fact that its degree of responsiveness is unheard of as compared to any other form of website designing protocol. The use of fluid grids, adjustable images, pixilation, format and queries related to media consumption are all nonexistent issues even with the varying screen sizes, which the website employs while using the HTML 5 design protocol for its website pages. For example, take the instance of BigQuery protocol software. BQ stands for Big Query, which is the software protocol for online virtual servers that can optimally analyze data sets within a large database being uploaded onto the net. The BQ uses similar protocols which allows a responsive interface in which the website can perform exceedingly well in any physical platform or device. BQ can be used to reconstruct an e-commerce site for a company making the site more practical and assessable on a mobile or Smartphone. This is relevant nowadays, when most purchases are made online using mobiles as the medium of transaction execution. For structural purposes, the markup for the HTML to be implemented must be lean and semantic. Additional user interface function such as an online keyboard in the case of a HTML input domain type can be designed for ready use by the user. The next step is to adjust the viewpoint to an acceptable degree. The application of a larger viewpoint is expected in those smart phones, which are designed, keeping in mind that the website assessed will be traditionally designed for non-mobile internet users. These browser viewpoints can be invoked using the pinch and pull mechanism to zoom in or out of a specific set of data, text or image on the website. Rigid or fixed positional elements are implicated but not recommended in mobile web user interface. Content fragments are rationally utilized to lessen the loading time of the website. HTML special characters are used to reduce background imagery through solid figures. The telephone URL Scheme is used to make direct calls through the click of a URL link. CSS employs Separate style sheet in case the larger screens are adapted for smaller resolutions. Design functionality and plasticity of layout are very important, when the use of HTML 5 is employed in mobile phones that have computing technical capability. Web layout is advancing day by day and the requirement is to make the web experience more vivid on different platforms.